You’ve been brought together by an international art syndicate to locate the Master’s lair, and retrieve the priceless art - you have one hour. It is critical that you work together as a team using all of your skills - we are counting on you. 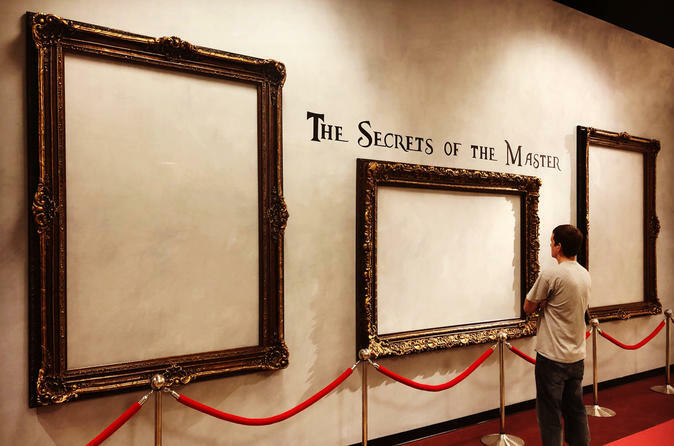 Will this be your masterpiece, or will you too vanish into obscurity? The Master 20 years ago the world was on the verge of its next great artist. A boy who was light years ahead of his time. His works were like none ever before seen. The media dubbed him, “The Master”. As his fame grew, so did the pressure, and one day he just vanished, never to be seen or heard from again. As time passed, the stories of “The Master” seemed more like legend than real life. Until recently, when valuable pieces of art began going missing from museums across the globe, replaced by perfect replicas. There was no one with this type of precision and excellence in the last 20 years, other than, “The Master”. When you arrive for your escape room adventure you’ll be greeted by your own Puzzle Master host, given a short tour and briefing, and everything you need to have a memorable experience. We are located inside the Boulevard Mall with our own entrance just minutes from the Las Vegas Strip, Downtown Las Vegas, and Henderson. Our brand new facility has plenty of free parking, clean facilities, snacks and beverages and is free of smoke and crowds. It is an easy ride from any Las Vegas location via private car, cab, or rideshare and private bus transportation will find it easy to drop off and pick up guests.